My Mosie had a habit of tip stalling. I now have reflex ie up aileron on both wings and reduced down throw on ailerons. It is far less prone to dropping a wing now. The last few times of flying its behaved like it had a rearward c of g with a lot of pitch sensitivity. Ive added some 200g of lead to the nose and have minimum throws on elevator and 40% expo but still its a roller coaster ride. Can upward reflex in the ailerons cause or increase this effect of pitch instability? Check to see if the wings have equal wash out in each wing....or wash in . Washout is your friend. It makes the inner part of the wing stall first, leaving the tips still flying. Is this the Seagull one, some people have been using a CoG of 130mm back from the leading edge not the 150mm in the manual to reduce the pitch sensitivity. I have a Brain Taylor one, and the CoG on that is further forward than the seagull one, 140mm from the front of the upper radiator inlet and my BT flies really well without being pitch sensitive. Mine balanced slightly nose down at 140mm with empty fuel tanks and retracts up, so the actual CoG was slightly less than 140mm. Some BT Mossie's have flown with the CoG around 125mm or so and these have also flown well. The BT model has some wash out built in and I have not needed reflex. DaveW, Sorry I am no expert, but I think adding reflex is not a simple solution as it has multiple effects depending on Aileen size/position. P.S. if you are reducing outer wing lift should the tip stall be worse? There is little loss of lift with reflex/washout this is replaced as the AOA of the wing increases thereby keeping the tip out of the stalled condition I think??? CofG moves when the wheels are retracted. It sounds like its being a warbird to me. Reduce the elevator rate until its nice to fly, and as already suggested i recommend you loose the expo until the rates are right. I recently had experience with a seagull hurricane and we ended up using half the low rate recommended in the kit. Its also possible your landing technique is leading you do the tip stall situation you mention. If you do a relatively long and flat approach holding the nose up with elevator and power then a tip stall is very likely, if however you do a steep approach with lots of flap (ie, drag) and virtually no elevator the wing is not going to stall on you until you as you come in. Just remember to add power as you pull into the flare and dont try to 3 point it. Land on the mains and let it roll out with the tail in the air. Wise words Jon. I have a Black Horse Mossie which flies very well and has never bitten me, using your landing technique, which I use for all my warbirds. When I get a chance I'll see where the c of g is as a percentage of chord, and report back. 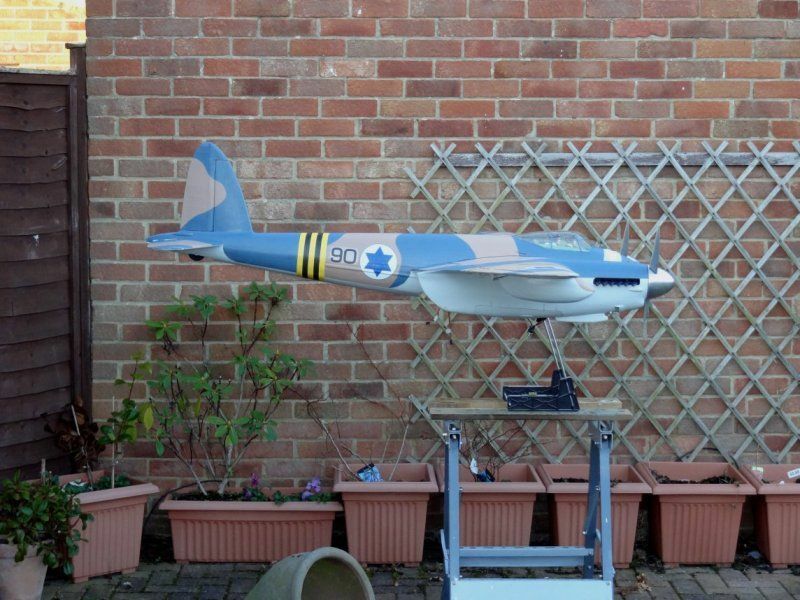 I have flown the Seagull Mossie at 150 and was very lucky to get it down in one piece. with the C of G forward an inch it was much better. Like others have said adding reflex increases the wing loading as it reduces lift. So swings and round abouts. Mine flies fine at around 125mm and slows down well without stalling. The C og G does move when the wheels are retracted, but the wheels provided by Seagull are very light, and I found it moved very little when up, but measure the c of g with them up, just to be safe. I know some have changed the wheels to heavy items, this may then be more of an issue. but either way measure with wheels up. Ive reduced throws and managed to shed a few grams from the rear and will decrease the reflex on the ailerons and try again tomorrow.